Graduate students are a huge, growing population, and a big revenue stream for colleges. However, they are changing ⎯ specifically with a shift from full-time enrolled to part-time students ⎯ and institutions have spent more time focusing on their initial recruitment rather than their continued success. It’s no secret that there’s been an increased focus on graduate student enrollment since the recession years. In the early 2000s, and especially after 2008, many people went back to school to advance their careers, which were under-supported by an unfavorable job market. Many students pursued advanced degrees full-time, either to delay student loan payments, to weather unemployment, to crawl out of underemployment, or in tandem with a full-time job. Between 2000 and 2010, full-time enrollment increased by 50 percent, while part-time enrollment increased by 22 percent. Many universities came to rely on graduate student tuition revenue as the number of students graduating high school simultaneously began to diversify and plateau. More recently, as the economy has stabilized, schools still saw growth in graduate enrollments, but at a slower rate. Between 2010 and 2015, full-time enrollment increased by only 3 percent, and part-time enrollments fell by 4 percent. 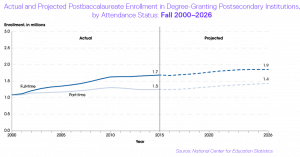 By the fall of 2015, there were 1.7 million full-time post-baccalaureate students and 1.3 million part-time post-baccalaureate students enrolled in the United States. Minus one. In Fall 2015, I took a leave of absence from my doctoral program. Like many of my peers, I first entered graduate school during the recession to open more doors careerwise, specifically within the Higher Education administration sector, and my journey has been far from a linear one. The motivations and factors that influenced my choice to enroll were vastly different the second time around: workplace discounts, the desire for a better job, time to degree, and program flexibility all around a travel-heavy, full-time work schedule. These influences were distantly followed by program quality, curriculum fit, and reputation; for my doctoral program specifically, I didn’t want my residency to be location-bound, given that my next career prospect might be out of state. Nonetheless, I finished, got a better job, and concurrently enrolled in a doctoral program to ensure I’d be effective in that new position. Even though I worked full-time, managing an entire department, took four weeks off each year to complete my residency on campus, spent weekends friendless writing papers, and pulled innumerable all-nighters to meet submission deadlines throughout my doctoral coursework ⎯ I was developing expertise in what helps students thrive and persist in college, while I felt I was thriving myself. Now, I’m actually finding the hardest part of my doctoral program to be the relatively unstructured, lower course load dissertation phase of the program. Not only did I struggle getting started in this phase academically, but when life threw me a few curveballs one year into my dissertation, I became a “stop-out.” I went from thriving to barely surviving in a short span of twelve months. As I get back in the saddle again and prepare to restart (and finish) my degree, there are a few reflections from my own experiences that align with current best practices in graduate enrollment management and student success. 1. Focus on the needs of adults in the graduate recruitment/enrollment process, and employ behavioral-driven tactics to reach your audience (SEO, shorter forms, a focus on ROI). First, we can’t treat graduate student enrollment patterns or recruiting practices the same as undergraduate processes. Since many graduate students’ motivations are tied to their career and home lives, it’s important to consider these factors in related recruitment, marketing, and counseling activities. Rather than emphasizing the generic “student experience” in initial outreach efforts, highlight tangible benefits such as online or hybrid course formats, program flexibility, and financial aid offerings early in the communication plan to attract more part-time or “new” traditional graduate students. This also requires thought around the timing of phone calls, availability of call center reps, and information sessions to help address this population. Is your program easy to identify online? Are you keeping forms short and mobile-friendly? How quickly are you responding to inquiry activity? And, do you have automated subsequent communication plans? What does quantifying the return on investment look like for you? Taking these questions into consideration and ultimately relaying how your program fits a busy professional’s lifestyle will help break through the clutter and set you apart from the competition. Here’s a quick graduate recruiting tip: don’t ignore the low-hanging fruit of institutional employees and undergraduate alumni who may be the easiest to convert! 2. Encourage the handoff between administrative areas (admissions, registrar, financial aid) and the department itself, making sure to capture a graduate student’s motivation at the point of enrollment and keeping it top-of-mind to ensure success/completion. Second, there’s a much greater emphasis placed on understanding graduate student enrollment patterns than there is graduate student completion patterns. We work so hard to build relationships and engage students to enroll them, but we often forget about how these factors impact their ability to complete a program of study. Understanding, tracking, and helping to develop students’ motivations early in the enrollment process can help retention efforts down the road. It’s important for us to remember that the absence of risk is not the same as a predictor of success. For example, if I have good undergraduate grades, solid tests scores, and a career in my field of study, on paper I may look like low-risk candidate for attrition. But, what if my motivation for pursuing that degree is to obtain a particular job, and I successfully apply for that job halfway through my program? If that motivation was initially captured and my program advisor notified, perhaps my motivation would have been nurtured and I’d have a stronger commitment to the program/finishing it. Maybe I’d even stay enrolled in the program even though I already received the job offer I was aiming for. But, if my unique motivation was never discussed at the point of enrollment or in my classes, what happens to my commitment to finishing the degree program? The handoffs between administrative and departmental areas, in general, need to be coordinated throughout the admissions, readmissions, enrollment, and re-enrollment processes so that nuances between university and departmental policies are seamlessly communicated, and so students have all the information they need to be successful. For students who are already on the fence about staying in or re-entering a program, poor or disjointed communication can affect confidence, motivation, and a sense that the school really cares about their success. 3. Maintain measurable strategies to help part-time students succeed and stay connected through Facebook/social media groups, school newsletters, scaffolding programs for completion, and/or guaranteed tuition rates for continuous enrollment. Third, looking ahead, we’re going to need a more proactive, pathway-driven approach for engagement and completion as graduate enrollment trends change. Between 2015 and 2026, part-time enrollment is projected to increase at a faster rate, 14 percent, than full-time enrollment, 10 percent. It should be obvious that part-time students’ motivations are different than those of full-time graduate students. However, many institutions are under-serving this population. Students who attend part-time feel disconnected from their institutions more easily because they have less frequent interaction with peers and faculty, school can become a tertiary (rather than central) part of their busy lives, and sometimes they receive fewer outbound communications. This can even include fewer transactional reminders about financial aid or registration, often due to an increased focus on reporting requirements and the revenue generated by FTE students. As the presence of part-time students increases, we can expect a longer period to degree completion, inconsistent or stop-out enrollment patterns, and therefore a less predictable net tuition revenue stream for graduate programs. As such, it will be crucial for institutions to focus on more meaningful ways to instill a sense of commitment and community among part-time students in graduate programs to keep them engaged and ensure timely completion. All things considered, I’m a living example of today’s part-time graduate student and proud of my journey thus far. I have my own unique motivations for attending part-time coupled with tangible degree aspirations, and I’m still working full-time. I, too, often times feel removed from my campus due to my part-time status, but there are different paths of engagement that reignite my commitment to the program. Some things that have helped me stay engaged as a part-time, stop-out student are check-in calls from my faculty advisors to finish what I had started, reminders and newsletters about re-enrollment deadlines, peers who have graduated and thoughtfully given me advice and normalized my situation, and even social media groups that highlight my classmates’ presentations and dissertation defenses. Qualifying part-time students’ motivations and directing them towards a pathway-focused approach from the initial point of enrollment can foster a stronger commitment to degree completion. Leveraging scaffolded programs and course sequencing that presents a clear path for part-time students to graduate within a set timeframe are also beneficial completion initiatives. Some programs may even consider offering a guaranteed tuition rate for continuous part-time enrollment, or embedding capstone requirements (like comprehensive exams, theses, or dissertations) gradually throughout the curriculum to help graduate students stay engaged with maintained focus on their degree goals. Even social media efforts have proven a rich source of support and community development for this population. Older TargetX is HEDA Core Compatible! Here's What You Need To Know.